Jupiter's south pole is seen in a series of time-lapse images taken by NASA's Juno spacecraft during its 11th close flyby of the giant planet on Feb. 7, 2018. You've never seen Jupiter's south pole quite like this. A new photo by NASA's Juno spacecraft show Jupiter's south pole as seen from above during a recent close encounter on Feb. 7. 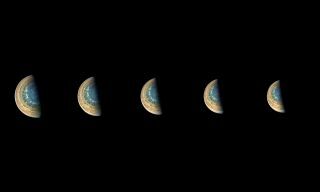 The photo is actually a series of images taken over time by Juno as the probe whipped around Jupiter during its 11th flyby of the giant planet. The time-lapse views of Jupiter were taken over a 40-minute period on Feb. 7, starting at 10:21 a.m. EST (1521 GMT), as Juno passed over Jupiter's south pole. Juno took the photos from distances ranging from 85,292 to 124,856 miles (137,264 to 200,937 kilometers). "Directly, the images show Jupiter. But, through slight variations in the images, they indirectly capture the motion of the Juno spacecraft itself, once again swinging around a giant planet hundreds of millions of miles from Earth," NASA officials wrote in the image description. Juno captured the photos with its JunoCam instrument. Those raw images were then processed by citizen scientist Gerald Eichstädt and assembled into the time-lapse series seen here. Juno's raw images are posted online as they are taken; the public can then review and process these images into amazing (and sometimes strange) views of Jupiter. You can access the JunoCam images here. NASA launched the $1.1 billion Juno mission in 2011, and the spacecraft arrived in orbit around Jupiter on July 4, 2016. The spacecraft takes 53 days to make one orbit of Jupiter. That extreme orbit brings the probe within 3,100 miles (5,000 km) of Jupiter's cloud tops at the closest point.